Range trading again for the EUR/RON as the 4.6600-4.6700 seems to be the equilibrium zone for the pair these days. For now, the upside potential looks dependant on the National Bank of Romania while the downside is likely limited to the 4.6500 area and reliant on the external context. Hence, stability could be the norm for the Romanian leu in the coming period. Quiet day in ROMGBs as the market still seems to be looking for a trend after the surprisingly successful February 2029 auction on Monday which ended the negative bias in the local currency bond market. With only short- to medium-term auctions left this month we could witness some interest for the longer term ROMGBs in the secondary market, in particular towards the month end on inflows into private pension funds. 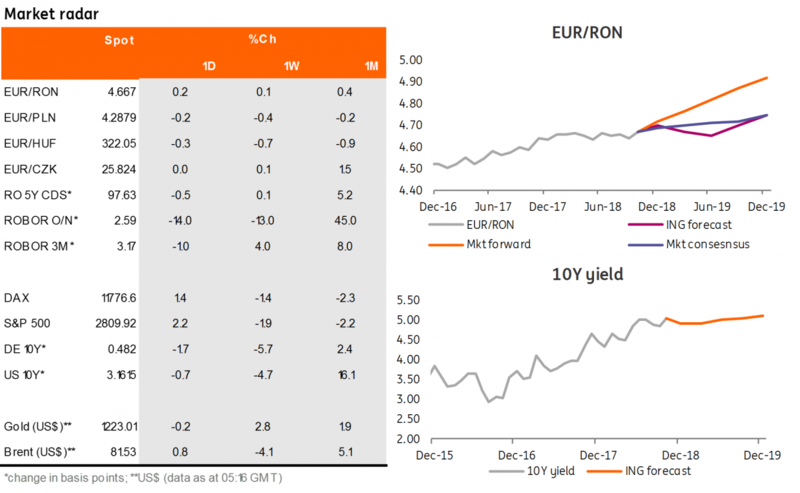 Quite a bit of steepening taking place these days in the money market, as the rates covering the current reserve period inched lower towards 2.50% while the 1M-1Y curve is now trading above the Lombard rate, in the 3.50-4.00% area. Liquidity looks ample these days but things could turn around after the monthly payments to the state budget. And they usually do.